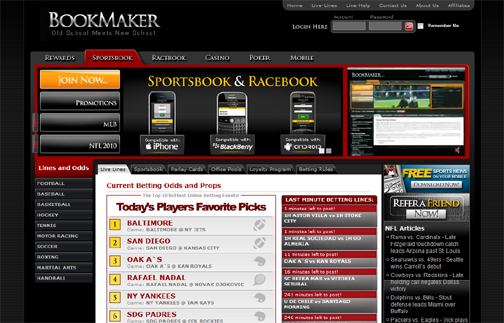 BookMaker.com was acquired by sports betting monster BetCRIS to support the US online sports betting industry. So, you can bet Bookmaker.com is one of the leaders for US online gaming – being supported by one of the prevalent bookmaking operations. BookMaker.com’s motto: “Where the Line Originates” isn’t farfetched. Many other books will hold off posting lines until they are set at BookMaker.com. SuperiorPoker highly recommends BookMaker.com for betting on sporting events, as well as online poker, casino games, horse racing, bingo and mobile betting from any location in the world, 24/7. BookMaker.com makes signup quick and easy. Follow the online form, enter your information, make your deposit and place a bet. BookMaker.com uses DGS software – a world leader in sports betting software. The UI is user-friendly and easy to follow. Our reviewers were up and navigating the site, making accounts and placing a bets in no time at BookMaker. Maximum: $250 up to $20,000 on NFL. Higher limits are available but only by phone. BookMaker.com offers wagers on the following sports: Pro and College Football, basketball, baseball, plus motor racing, soccer, Aussie rules, golf, handball, hockey, MMA, tennis, boxing, horses and office pools. Regular 20 cents line (-110/-110). There is a $300 minimum deposit to qualify for a welcome bonus at BookMaker.com. There is a $500 cap on the bonus. Players may not redeem if depositing with a credit card. Reload bonus: 10% re-up for deposits of $100 plus and a 3 times rollover requirement. Bonus amount is capped at $500 and credit card deposits do qualify. BookMaker.com Loyalty Program: points are earned on every wager and are redeemable for Free Play Bonus Awards. BookMaker.com Refer a Friend Program: friends must deposit $300 or more and you will be awarded with 10% of the value of their first deposit. The max bonus is $300 with 3 X rollover required and credit card deposits do not qualify. BookMaker.com offers a 24/7 call center with excellent Service Agents. Support is available via email, phone and live chat. BookMaker.com also has quality self-help support in FAQs, demos and a glossary of terms. BetCRIS, which owns BookMaker.com, is one of the largest sports betting businesses in the world. They book over $2 billion in wagers every year. It’s safe to say that they are financially secure. Sportsbook.com deposit methods: Credit Cards, Ecocard, Click2Play, ewalletXpress, ClickandBuy, ipoint, Moneybookers, Instadebit, BankWire, BankDraft, PersontoPerson Transaction, and Neteller. Withdraw methods: Instant Check, Neteller, PersontoPerson Transaction, BankDraft, Moneybookers, BankWire, and Click2Play. Cashouts can take 7-10 business days to process.